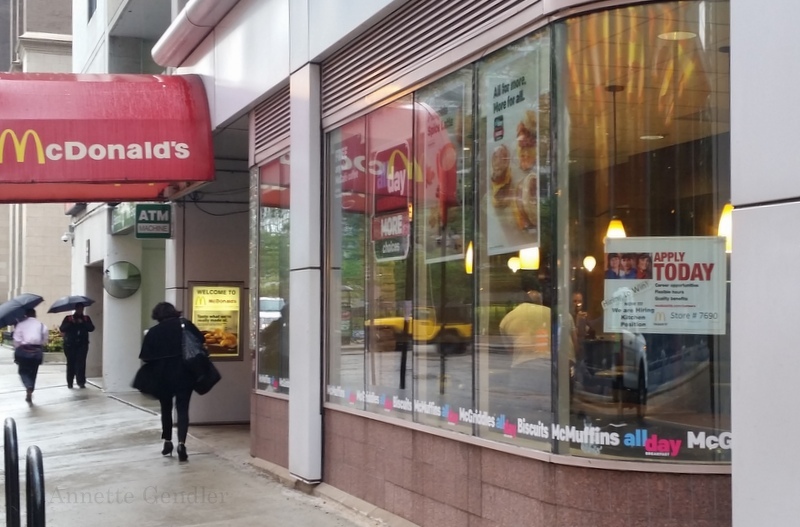 Yesterday morning I had occasion to walk around the downtown Chicago neighborhood of Streeterville where I used to work eight years ago. It’s always interesting to see how much it has changed and yet, how much it is still the same. 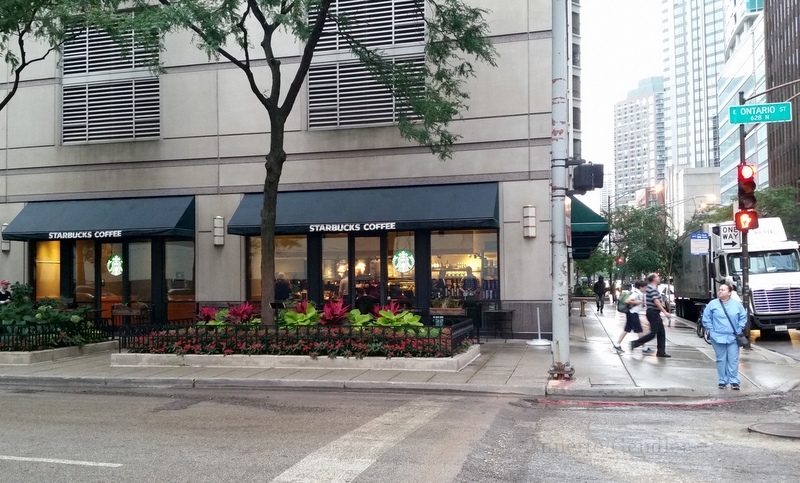 This is the Starbucks where I used to sit in the window seat (when they still had them), off to the left in this picture. A colleague and I would sometimes even go there to work. 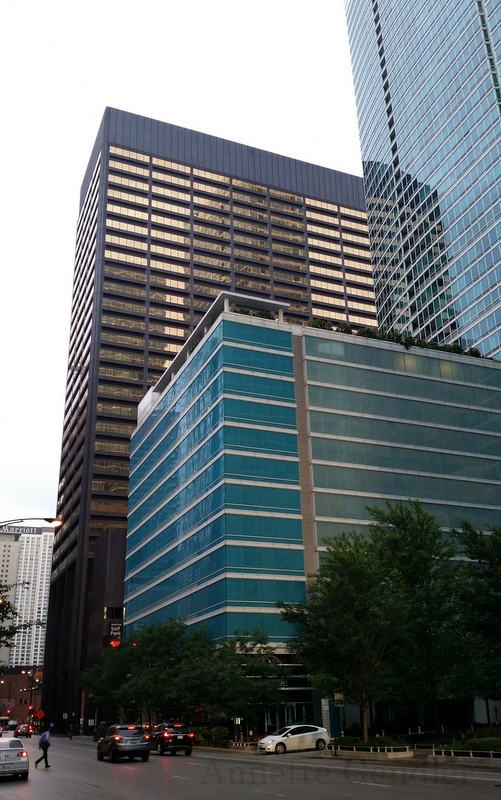 For fifteen years, I worked on the 21st floor of the copper-mirrored building, which is still called the Time Life Building because, long before I worked there, it actually was the Time Life Building. For most of my time my office was on the east side of the building, which you can see here, looking out over Lake Michigan. The blue buildings are fairly new; I watched them go up from my office window, and I was nervous more than once that a building crane would crash in. 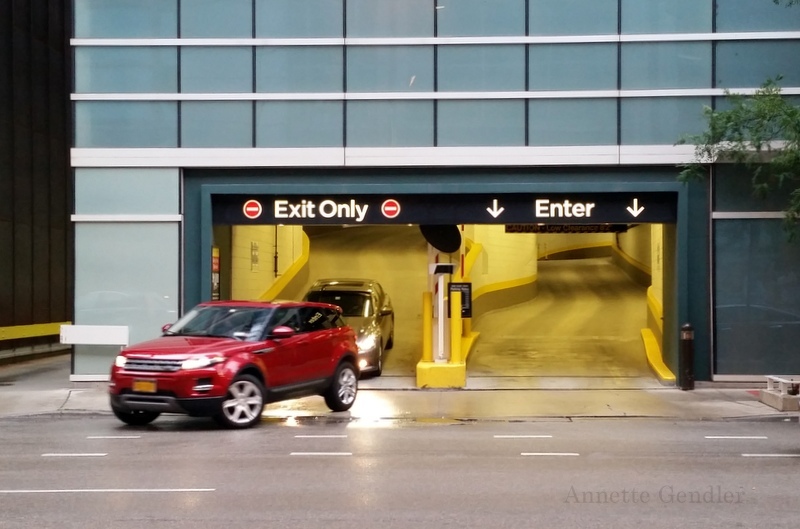 Ah yes, out of this garage I often stormed, usually in a hurry to pick up my kids, because most days I didn’t drive but took the train to work. If I had the car, it meant time was tight. 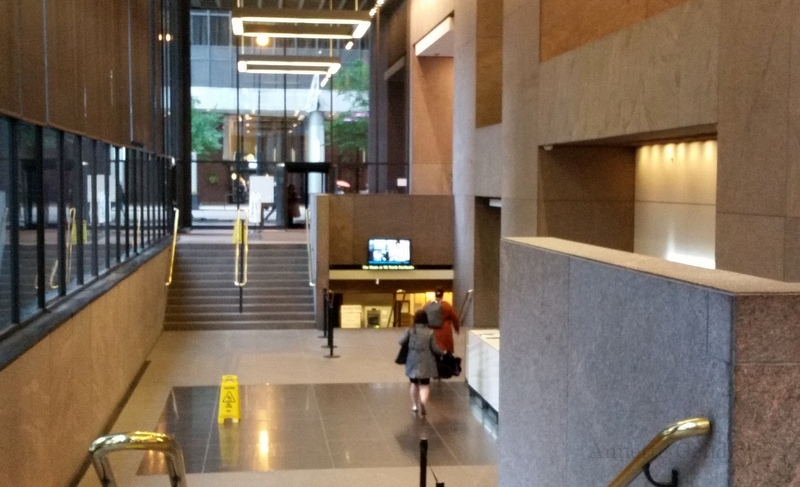 The sunken lobby of the Time Life Building–how many times did I walk down those steps to where Frank the doorman, who retired shortly after I left, would greet everyone (and he pretty much knew everyone who worked in the building!). How easy it would be to ride up the elevator again and slip into my old life! But alas, this isn’t possible anymore. The old firm moved to a different location. The old days are definitely gone. And the new doormen were throwing funny looks my way while I was taking pictures there. 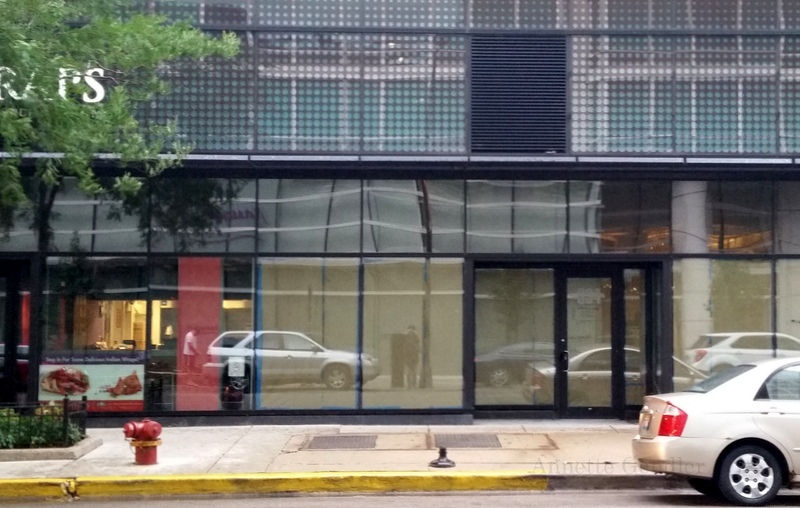 This completely redone store front, it is hard to believe, used to be the entrance to the subterranean former McClurg Cinema, where movie premiers in Chicago used to be held. I remember people standing in line and camping out for Star Wars Episodes I, II and III came out. 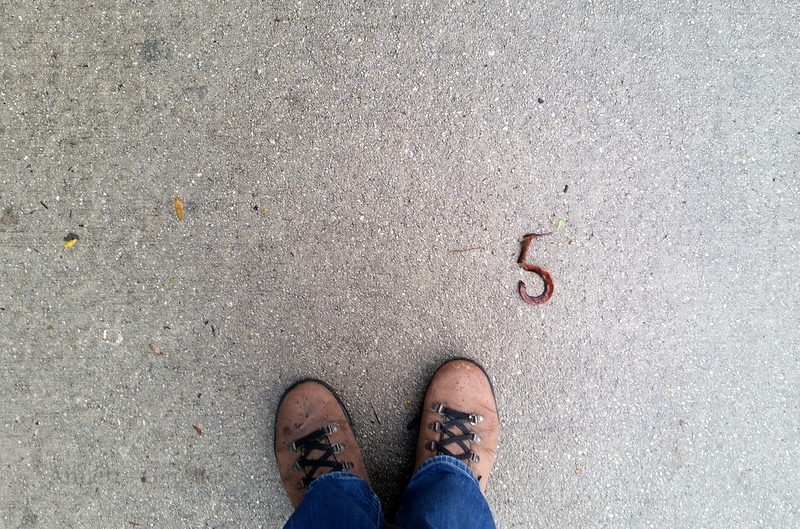 Lastly, I spotted this cool seed pod “5” on the sidewalk because, as I you can tell, I was looking around. Anyway, it’s an odd thing, to be so familiar with a place and then actually not to be, to tread the familiar routes, to feel like the old life is just around the corner when, in fact, it has evaporated. We who used to run around here are all gone, in different places (my former boss has actually passed away), and the place itself is different in some ways. And yet, in other ways, it is the same. You've described the feeling of visiting the past so well, I always get this feeling when I go to my old neighborhood. Great story! I have not left my hometown but I can still see the changes. A building I worked in for 10 years and which had been there for 30 years was just recently torn down and is now a vacant lot. Kind of sad sometimes. Yeah, isn't it interesting how we get attached to a building that isn't even ours? I feel so nostalgic revisiting old places 🙂 There used to be a Barnes and Noble and Starbucks (when I was in college and then later when I was unemployed). I was so sad to see both close, they were such great stomping grounds. Losing familiar stomping grounds is a sad thing. I hope you have found new ones! The phrase you can't go home again comes to mind- things change over time. Indeed, and yet there is this odd familiarity that you can't shake either.